Just saw this yesterday. Is this per USAC rules? Women riders can enter master's races? Awesome. Can master's racers enter women's races? No. Well, maybe with enough makeup. I believe they can go up to 20 years older than their racing age. Why can a female Cat 2 racer enter the men's Pro/1/2 race to get race miles in her legs, but I can't as a male Cat3? I realize the rules are the rules, but this kind of favoritism kind of irks me. A woman (including domestic pros) wouldn't last 1/2 of a 35+ race around here. Exactly why I don't get why they let them do it, but not me/us. I raced with P/1/2 boys all spring, and did a decently large 1/2/3 race earlier this year with good results, so I know I can handle the pace. A woman I ride with hung in with a breakaway group in a Mens 45+ field (she was in her late 20's at the time I think). That pissed off a few guys. You men have it easy it many respects. In many cases there are a lot more guys fields compared with women's fields. Even in norcal his year I've seen more than a few promotors drop the women's fields and leave them with no options. In some cases certain groups og guys can race as many as 3 times in one day. Oh...I'm okay with it. And I have seen a few women last with the men. They usually fade on the last lap/sprint, though. How come nobody has posted Tammy Thomas photo yet? There was a woman in the Masters Men 40+ race in Ontario, CA yesterday. She was in the race for a while but I don't remember seeing her at the end. However, a lot of men got shelled during this race. Instead of Tammy Thomas, how about a photo of Laura Van Gilder? how about a photo of Laura Van Gilder? just a pinch between her cheek and gums. 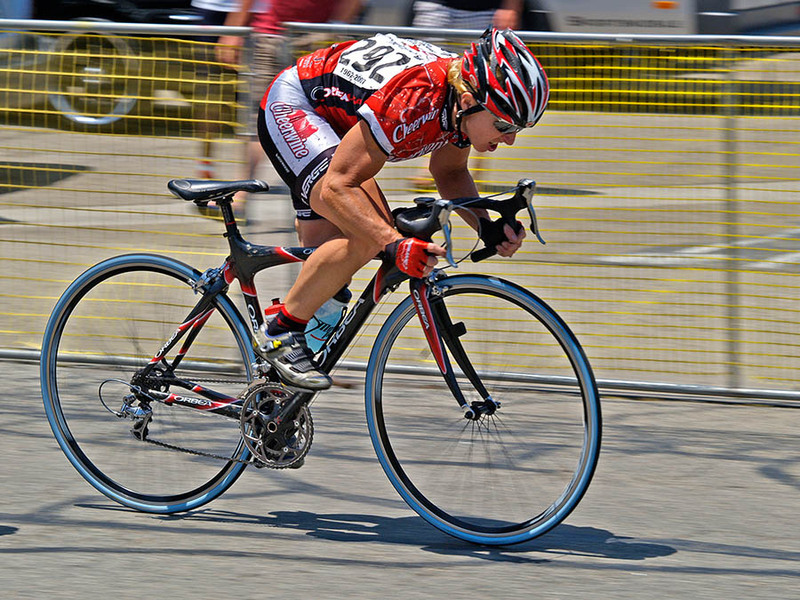 Karen Bliss used to win cat3 mens races. That was always cool. We have a couple gals that do masters races and will sometimes even pop a top10 if conditions work just right. Marion Clignet almost exclusively raced mens races in France in order to prepare for bigger ladies events. She did well too. Dede Demet (Barry) rode in some of the Pro men's races in Superweek in 1993. I was the TV producer for the Sports Channel package. The "executive producer" told me not to show her in the footage because he said it would diminish the race. He thought that that the average viewer would think "if a girl can do it..."
We have at least a few women in SoCal who can hang in the mens races. It's important for the more competitive ones to get time in big fields so that when they go to the big events they can ride safely in a fast pack and know how to race a big field as well as a small one. When they get blown out the back 5 laps in, when I could probably last the entire race (I have before, several times), yet not allowed to, that kind of bothers me. Why? Because I don't understand why a female Cat 2 is more or less qualified to race against the Pro/1/2 men than a male Cat 3.
hate to break it to you, but 50+ isn't a 'huge event'. It is for a lot of women's fields. I think he was saying that women, who are used to racing in fields of 30-50, might be a little wierded out by the pace, pack size, and size of the individual competitors. 150 dudes at 30mph ain't the same as 45 women at 25mph. There aren't a lot of women's fields at local and even regional events that are even 45 in a single field. There are only about 300 licensed women in SoCal (compared to about 3000 men). The dynamics of a field of 40 to 100 are very different than the dynamics of 10-15 (especially when there are big differences in the physical abilities of the 10-15). Riding with the men's field is a lot closer to what they'll get when they get to national events with 50+ riders than what they'd get in a typical women's field. It's similar in other sports-- a lot of the women at the elite level in things like hockey, soccer, or basketball played against men a lot of the time when they were growing up. And I've seen 100 lb girls school 200 lb cat 2 guys in a miss & out. Last edited by bitingduck; 07-23-07 at 09:47 PM. Some are, some aren't. Depends on the region and the women. Women are allowed to race up to one category down when they race with the men (Cat 2 women can race with cat 3 men)-- it's their choice depending on what they want out of the race. And if you're that good of a cat 3 just score some points and upgrade. When was the last time you raced in a field of 150? I've done 3 NRC races this year and a race with a $30,000 prize list. Two of those races had 150 dudes. I will give this to you though, all four of those races had more men in the Pro/1 field than women in the Pro/1-2 field. The masters race that the original poster was talking about definitely did not have 150 men. I think I know who mkadam is talking about. She did my race as well, the Pro/1-2-3 category. There were two women in our race and I'm not sure if either of them finished because they didn't make the break. Before the break rolled though, they were doing a lot more racing than 95% of the 3's were. I trust the bike handling of many of the Cat. 1 and 2 women more than I trust the bike handling of most of the male 3s. I might be in the race at Elk Grove in the 1's/2's if I get a good result this upcoming weekend or next. I personally haven't been in a race with 150 guys, but 100 is a pretty reasonable guess for some of the others. I'm just saying that having raced P/1/2/3 races before, as well as superweek 3's, I think I have a better shot at doing well than a female Cat 2. My fields have all be significantly larger and significantly faster than the women's fields at all of the races. The men's races in the P/1/2 are about 2.5x the size of the women's field. I'm not saying you don't have a chance of doing better than the women. I guess they just have to be offered the chance to race. I'm also not saying I agree with it (allowing women to race with men if there is a category specifically for them). I can see where it would be a good experience for a cat. 3 who is on the verge of upgrading, but for others and especially new 3s it can be a waste of time and a danger to others, but if the race is Pro/1-2-3, they are allowed, usually to do a second race. From my experience this weekend and in past races, women will usually stay out of the way if they are incapable of contributing to the race. I guess with the 3s there is ego involved and they usually end up getting in the way when the race gets hard (usually they have already raced once). The two women I witnessed this weekend were actually rotating through when a break was being chased and one of them was in the thick of things when the field was starting to tear apart. I saw about the same number of 3s who were trying to take part in the race. The rest of the 3s (about 20-30) were sitting in the back or getting in the way. The results for the top 20 show no women or cat. 3s and only five cat. 2s.